On Saturday I was going through a twitter page called Chicago's Extinct Businesses and just retweeted relevant tweets pertaining to certain areas of the south side. One of these tweets showed an ad for a business once located at 610 W. 63rd Street. Right in the heart of Englewood. 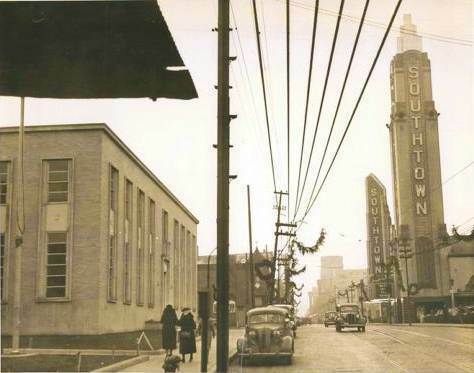 The Southtown Theatre finally closed in August 1958. It was demolished in 1991 after serving for many years as Carr’s department store and after that, a flea market. An interesting note—two plaster musician busts from the Southtown ended up in the restored Lake Theatre in Oak Park, IL. On this blog we have referred to the Southtown before and here's a nice shot of the theater via Cinema Treasures. We really missed the ball when this magnificent building got torn down in 1991. Though this just means with the right amount of funds an opportunity can present itself.